↑ Li XY, Mattei MG, Zaleska-Rutczynska Z, Hooft van Huijsduijnen R, Figueroa F, Nadeau J, Benoist C, Mathis D (Mar 1992). "One subunit of the transcription factor NF-Y maps close to the major histocompatibility complex in murine and human chromosomes". Genomics. 11 (3): 630–4. doi:10.1016/0888-7543(91)90070-U. PMID 1774067. ↑ Maity SN, de Crombrugghe B (Jun 1998). "Role of the CCAAT-binding protein CBF/NF-Y in transcription". Trends Biochem Sci. 23 (5): 174–8. doi:10.1016/S0968-0004(98)01201-8. PMID 9612081. ↑ "Entrez Gene: NFYB nuclear transcription factor Y, beta". ↑ Pise-Masison CA, Dittmer J, Clemens KE, Brady JN (Mar 1997). "Physical and functional interaction between the human T-cell lymphotropic virus type 1 Tax1 protein and the CCAAT binding protein NF-Y". Mol. Cell. Biol. 17 (3): 1236–43. doi:10.1128/mcb.17.3.1236. PMC 231848 . PMID 9032250. ↑ Izumi H, Molander C, Penn LZ, Ishisaki A, Kohno K, Funa K (Apr 2001). "Mechanism for the transcriptional repression by c-Myc on PDGF beta-receptor". J. Cell. Sci. 114 (Pt 8): 1533–44. PMID 11282029. ↑ Bellorini M, Lee DK, Dantonel JC, Zemzoumi K, Roeder RG, Tora L, Mantovani R (Jun 1997). "CCAAT binding NF-Y-TBP interactions: NF-YB and NF-YC require short domains adjacent to their histone fold motifs for association with TBP basic residues". Nucleic Acids Res. 25 (11): 2174–81. doi:10.1093/nar/25.11.2174. PMC 146709 . PMID 9153318. Lloberas J, Soler C, Celada A (1998). "Repression mechanisms of the I-A beta gene of the major histocompatibility complex.". Immunobiology. 198 (1–3): 249–63. doi:10.1016/s0171-2985(97)80045-9. PMID 9442396. Mantovani R (1999). "The molecular biology of the CCAAT-binding factor NF-Y". Gene. 239 (1): 15–27. doi:10.1016/S0378-1119(99)00368-6. PMID 10571030. Li XY, Mantovani R, Hooft van Huijsduijnen R, Andre I, Benoist C, Mathis D (1992). "Evolutionary variation of the CCAAT-binding transcription factor NF-Y". Nucleic Acids Res. 20 (5): 1087–91. doi:10.1093/nar/20.5.1087. PMC 312095 . PMID 1549471. Lloberas J, Maki RA, Celada A (1995). "Repression of major histocompatibility complex I-A beta gene expression by dbpA and dbpB (mYB-1) proteins". Mol. Cell. Biol. 15 (9): 5092–9. PMC 230756 . PMID 7651426. Pise-Masison CA, Dittmer J, Clemens KE, Brady JN (1997). "Physical and functional interaction between the human T-cell lymphotropic virus type 1 Tax1 protein and the CCAAT binding protein NF-Y". Mol. Cell. Biol. 17 (3): 1236–43. doi:10.1128/mcb.17.3.1236. PMC 231848 . PMID 9032250. Bellorini M, Lee DK, Dantonel JC, Zemzoumi K, Roeder RG, Tora L, Mantovani R (1997). "CCAAT binding NF-Y-TBP interactions: NF-YB and NF-YC require short domains adjacent to their histone fold motifs for association with TBP basic residues". Nucleic Acids Res. 25 (11): 2174–81. doi:10.1093/nar/25.11.2174. PMC 146709 . PMID 9153318. Currie RA (1998). "Functional interaction between the DNA binding subunit trimerization domain of NF-Y and the high mobility group protein HMG-I(Y)". J. Biol. Chem. 272 (49): 30880–8. doi:10.1074/jbc.272.49.30880. PMID 9388234. Currie RA (1998). "NF-Y is associated with the histone acetyltransferases GCN5 and P/CAF". J. Biol. Chem. 273 (3): 1430–4. doi:10.1074/jbc.273.3.1430. PMID 9430679. Currie RA (1998). "Biochemical characterization of the NF-Y transcription factor complex during B lymphocyte development". J. Biol. Chem. 273 (29): 18220–9. doi:10.1074/jbc.273.29.18220. PMID 9660784. Bemark M, Olsson H, Heinegård D, Leanderson T (1998). 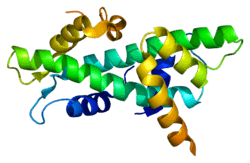 "Purification and characterization of a protein binding to the SP6 kappa promoter. A potential role for CArG-box binding factor-A in kappa transcription". J. Biol. Chem. 273 (30): 18881–90. doi:10.1074/jbc.273.30.18881. PMID 9668064. Faniello MC, Bevilacqua MA, Condorelli G, de Crombrugghe B, Maity SN, Avvedimento VE, Cimino F, Costanzo F (1999). "The B subunit of the CAAT-binding factor NFY binds the central segment of the Co-activator p300". J. Biol. Chem. 274 (12): 7623–6. doi:10.1074/jbc.274.12.7623. PMID 10075648. Hake SB, Masternak K, Kammerbauer C, Janzen C, Reith W, Steimle V (2000). "CIITA leucine-rich repeats control nuclear localization, in vivo recruitment to the major histocompatibility complex (MHC) class II enhanceosome, and MHC class II gene transactivation". Mol. Cell. Biol. 20 (20): 7716–25. doi:10.1128/MCB.20.20.7716-7725.2000. PMC 86349 . PMID 11003667. Liang F, Schaufele F, Gardner DG (2001). "Functional interaction of NF-Y and Sp1 is required for type a natriuretic peptide receptor gene transcription". J. Biol. Chem. 276 (2): 1516–22. doi:10.1074/jbc.M006350200. PMID 11022037.